Maha Jouini is an Addis Ababa-based Tunisian blogger, and women’s rights and indigenous rights activist, with a special focus on the Amazigh community. She collaborates with the Campaign to End Child Marriage and is on the executive board of the Regional Coalition of Women Human Rights Defenders in the Middle East and North Africa (MENA). She is also a translator for Global Voices. 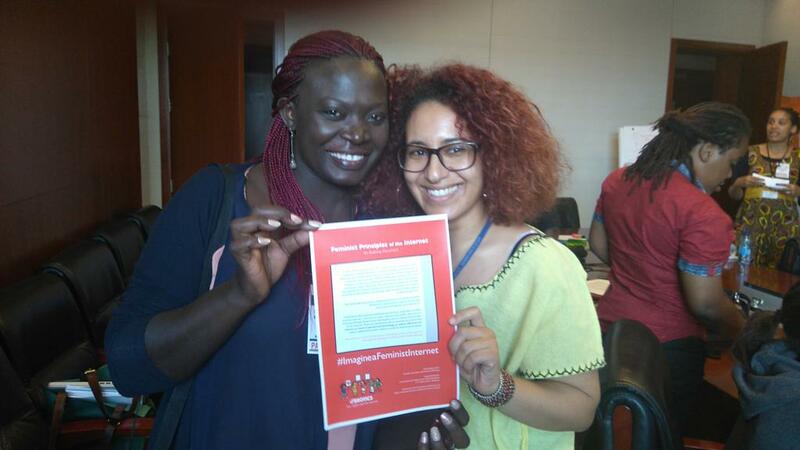 APC’s Leila Nachawati met Meha in Addis Ababa during the African School on Internet Governance (AfriSIG) in September. Leila: How does the internet affect your work as a women’s rights and indigenous rights activist? Meha: The internet, particularly blogging, has been the only way for me to publicly express who I am, as an Amazigh woman activist. No commercial platform will welcome discourses from minorities, marginalised cultures, especially from the MENA region, where governments do not believe in diversity and want a unified, non-diverse society. I started blogging after 2011, to explain to people, “This is not an Arab Spring, it’s a democratic spring.” I collaborated with platforms focusing on Amazigh rights, from French spaces to Algerian, Libyan, Moroccan spaces, to share this message: We are brothers and sisters and we should be together for our identity throughout the world. Through the internet I made a huge number of connections that could not have been possible offline. I have around a million followers of my articles, mostly from marginalised communities in MENA (Kurds, Tuaregs, and other forgotten communities). I focus a lot on powerful women from the Amazigh history in the region, and their influence in current issues. Also, we highlight the struggle of the women who have lost their virginity and their right to marriage. The hypocrisy around virginity and the double standards. Leila: As a Tunisian feminist, what future would you like to see for women in your country, and in the region? I see feminism as my way to express myself however I choose, starting with what I wear. Choosing whether I wear a long or short skirt, have my hair covered or uncovered, wearing red lipstick if I want to, and walking down Bourghiba street without anyone touching me or harassing me on my way home would be a dream come true. Walking freely, dressing as you choose, without being bothered, is a basic right but still a dream for many women. Regarding being a Tunisian feminist, and an Amazigh feminist, I am well connected with NGOs in different countries, and in the gender meetings I insist that I am a feminist from my own background. We don’t need the Western frameworks of feminism that are often imposed on people in other regions. We have our own traditional marginalised societies and we should build our own fight, our own frameworks in our countries and in the region. Leila: You took part in the African School on Internet Governance and the Gender and Internet Governance Exchange, will they be useful for your work? Meha: Yes. I learnt a different point of view on internet governance from that of businessmen, government, civil societies, high level decision makers. I now see net neutrality and women’s rights from a richer point of view. I can now write with a stronger framework, to raise awareness of the importance of the battles that are taking place in online spaces. I also learnt about CEDAW, African charters and conventions, and other instruments that are very useful. We need to refer to those charters from an internet users’ perspective, since online threats are increasingly important. Throughout the whole meeting, I was promoting my pan-African passion, which surprised our sub-Saharan African colleagues, who did not expect a Tunisian to be so passionate about the continent. In general, I am very interested in the work of APC, especially after I knew about the Feminist Principles of the Internet. I thought that AfriSIG may help me implement those principles in my work as a women’s rights and indigenous rights activist. Leila: Do you know it’s APC’s 25th anniversary? Could you send us a happy anniversary wish?